What a wonderful story! Baseball games and now we have a couple hand in hand exchanging their vows. Congratulations B & J! 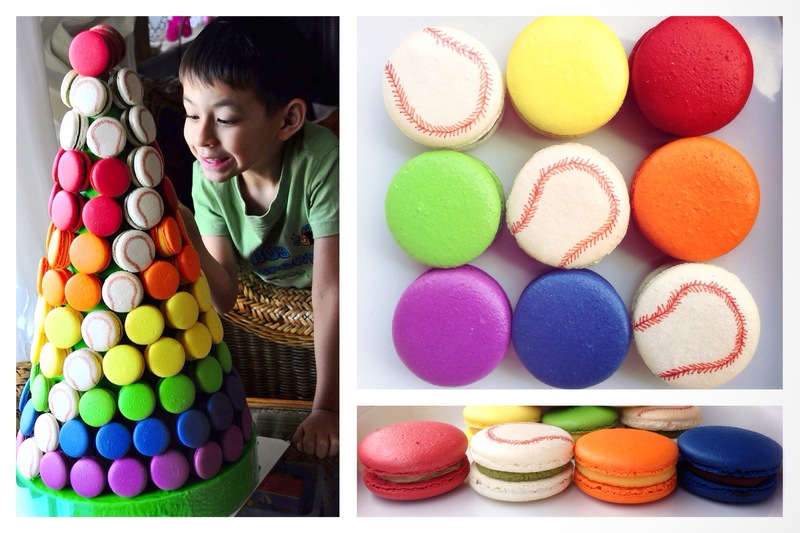 To celebrate the colours of love and embrace their beautiful story of how they met, I took the honor to put together this Macaron tower for their wedding. I know I know my little boy loves it. Look at his smile and his wide eyes! 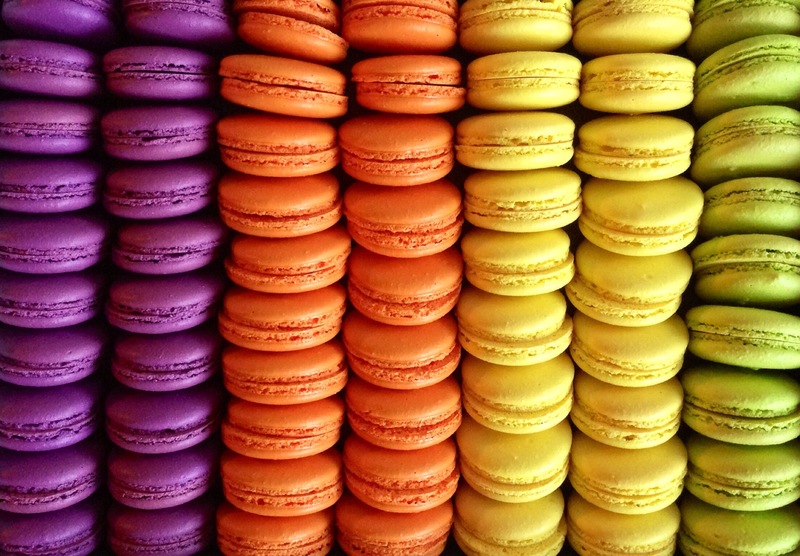 There are 7 colours and 4 flavours. 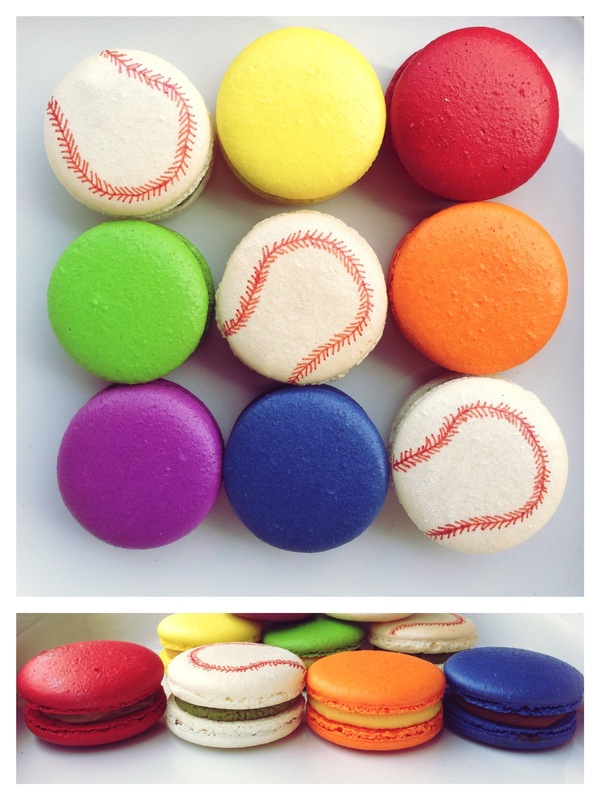 So yes I baked 7 batches of macarons in 2 days. It was like a marathon! And I had a couple of disasters when I rushed through the baking. 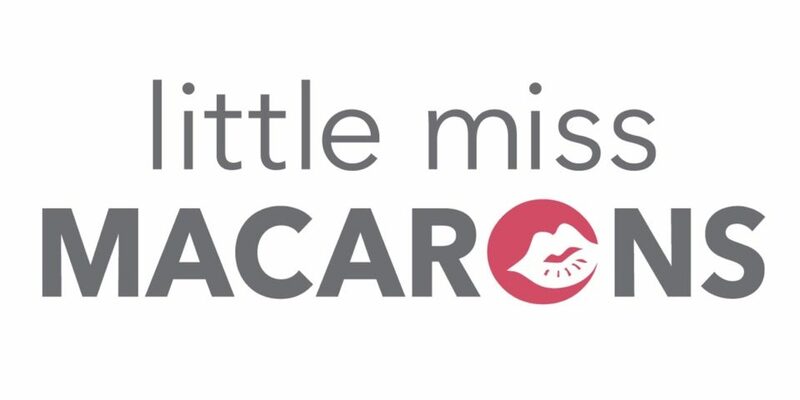 Yes listen number one on Macaron making – no rushing. It won’t work! 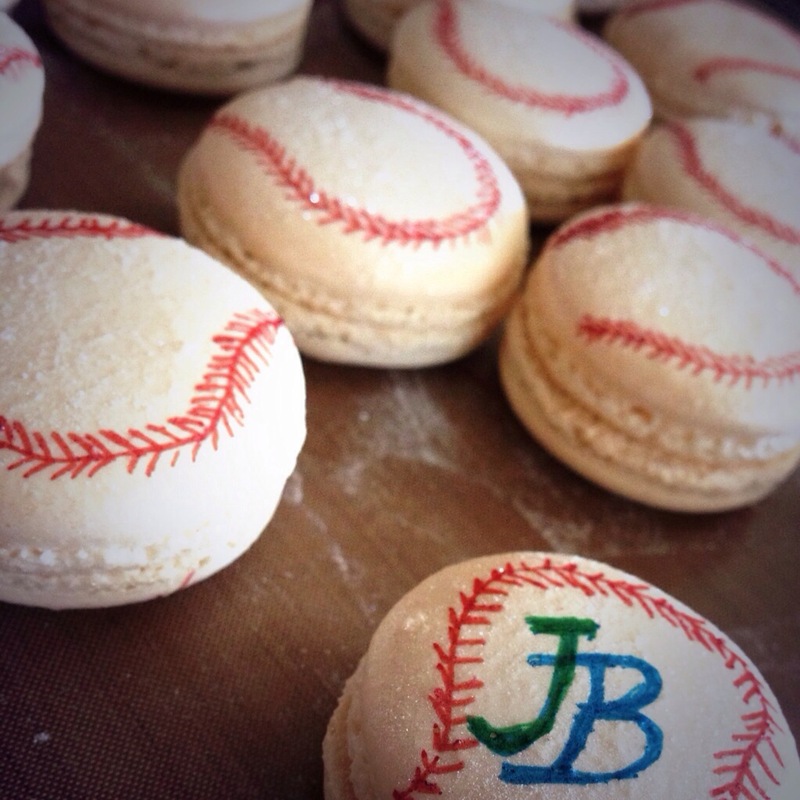 Now it comes to the baseball macarons. Well being me (or should I say stupid?) I thought royal icing would be a good option and I just simply pipe the pattern onto the white macarons. Wrong! Even with the smallest piping tip, it’s still far too thick to make the delicate patterns on it. Then I thought hang on a minute, didn’t I buy some cookie writer pens that I never used? (It’s just one of the million baking related things I bought and never get used). They are just perfect and very easy to use. 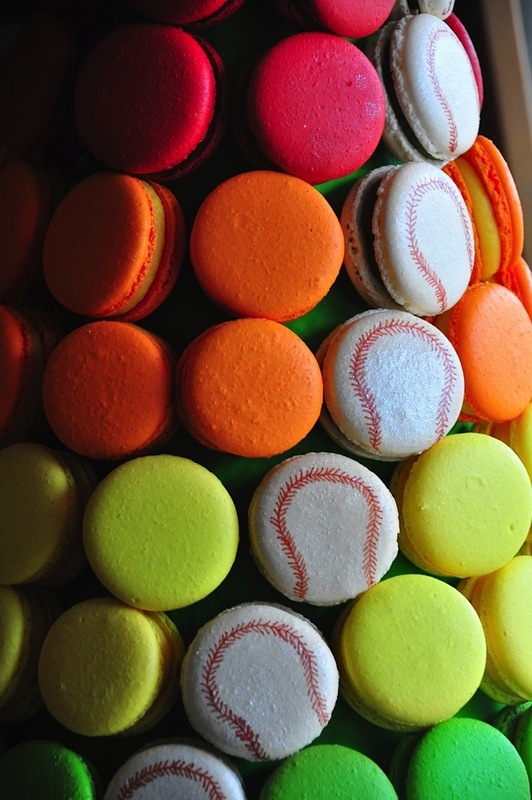 I didn’t take any photos of how I put together the Macaron tower. But I will when I do one next time and I will show you how easy it is to get one done. 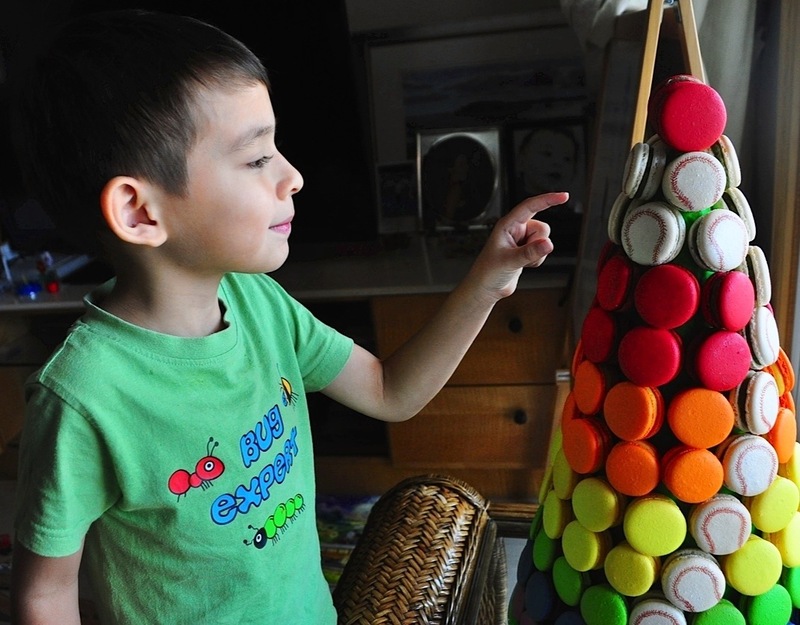 If you are up for a Christmas Macaron tower then don’t forget to sign up for updates from my blog (marketing? Nah just trying to sound interesting). I have not done anything too fancy on the flavours. They are just classic ones – dark chocolate ganache, salted caramel with coffee, green tea buttercream and passion fruit lemon. In my next post I will share my recipe on the salted caramel with coffee. I absolutely adore the diversity of the flavours and the surprises of the hint of saltiness. 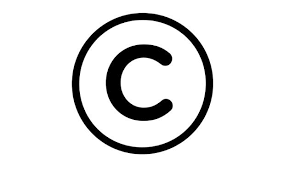 Will keep you all posted on my next project! Next “Bacon & Egg Sandwich” vs “Bacon & Sundried Tomato Macaron” – Celebration of home cured Bacon!